Why retailers love airport outlets. Last year, electronics retail store Croma Retail decided to sell JBL speakers at its store in Delhi's T3 domestic airport terminal. To begin with, it was an experiment. After all, why would anyone buy a set of speakers at an airport terminal of all places? But the strategy paid off. The entire stock of speakers, priced at Rs 5,990 each, flew off Croma's shelves. "The price was not reduced nor was there a special deal. All we did was give the brand prominent shelf space, which makes a huge difference to sales," says Ajit Joshi, MD, Infinity Retail Ltd. Croma is part of Infiniti Retail, a 100 per cent subsidiary of Tata Sons. Croma was among the first of the big retailers to foray into airport retail in India in October 2007. Today, airport retailing has become a business no chain can ignore. Croma already has seven airport stores across Mumbai, Delhi, Hyderabad and Ahmedabad. It has plans to set up stores at Kolkata and Chennai airports soon. Sales at its airport stores are growing at about 17 per cent annually, says Joshi. The products especially in demand at Croma's 850 to 2,000 sq ft airport stores are accessories such as scratch guards, covers, mouse, power banks and pen drives. These are typically in the price range of Rs 600 to Rs 4,000. The affluent Indian traveller today is also open to shopping for big ticket items at airports such as tablets and smartphones. Croma sold close to 15,000 smartphones at its airport stores in the past year. Airport retailing is a popular concept globally but is still in its infancy in India. The non-aeronautical revenue (largely from retail) is more than double the aeronautical revenue at most airports abroad, but in India it is the opposite. Singapore's Changi International Airport's revenues from retail operations - with more than 350 stores - were over S$1.9 billion (US$1.5 billion at current exchange rates) in 2012/13. However, airport retailing appears poised for an impressive take off in India. The renovation of most major airports is underway with large dedicated areas for retail stores. The recently opened T2 terminal at Mumbai's Chhatrapati Shivaji International Airport for instance, has about 700,000 sq ft area - the size of over 10 soccer fields - dedicated to retail, food and beverage, lounge and travel services. Similarly, the retail space in Delhi's T3 terminal is spread over 290,000 sq ft.
Apart from Croma, prominent brands with a presence at Indian airports are Shoppers Stop, Hidesign, William Penn, Pavers England, WH Smith, among a host of others. Delhi's Indira Gandhi International Airport, for instance, (terminals T1 and T3 combined) has close to 500 brands spread over 323,000 sq ft. Most of these retailers plan to scale up and are upbeat about the future. Shoemaker Pavers England operates 14 stores at airports, and its officials say the products that sell more are the high priced ones. Its stores are small, between 150 and 300 sq ft in size, with products offered varying according to location. "What Chennai airport has may not necessarily be there at Mumbai airport, and what Mumbai airport has might not be available in Cochin," says Utsav Seth, CEO of Pavers England India. "White shoes sell well in Hyderabad, they don't in Delhi." Pavers England's stores at airports do better than its regular ones, adds Seth. It is a similar story for pens and accessories retailer William Penn. "The highest selling products are writing instruments," says the company's CEO, Nikhil Ranjan. The company gets about 10 per cent of its total revenue from its airport stores, three in Delhi and one in Mumbai. It is now actively looking at setting up shop at most of the newly developed airports across the country. "In recent years, not only has passenger traffic gone up significantly with more low-cost airlines on the scene, but also the time spent by passengers at airports has increased due to early check-in times set by airlines following security and operational concerns," says Devangshu Dutta, CEO of consulting firm Third Eyesight. "This has increased retail opportunities, and airports in recent years are planning retail as an integral part of operations, rather than tucked away in low-traffic corners." Retailers say it makes sense to be present at airports. "Airports are a very good place to get customers. 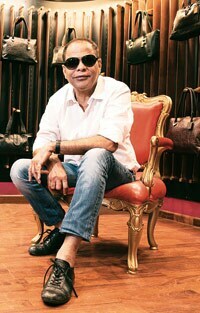 More so, since there has always been shortage of quality retail space in India," says Dileep Kapur, President of leather bags and accessories-maker Hidesign. Already, global airport retailers are eyeing opportunities in India. Nuance Group AG, the world's largest international airport retailer, through its joint venture with Shoppers Stop Ltd, has been present in the Indian travel retail market for six years. The company currently operates 19 stores at Mumbai International Airport and five at Bangalore International Airport. Nuance manages almost 770,000 sq ft of retail space globally and operates 300 outlets in 64 locations across the world. It reported an aggregate revenue of CHF (Swiss francs) 2.6 billion (Rs 18,116 crore) in 2012. "India has huge potential to grow. Airport infrastructure is being developed and we will see the results soon," says Anirban Dutta Chowdhury, Country Head, Nuance India. The retailer's highest selling product is liquor, followed by confectionery and perfumes. 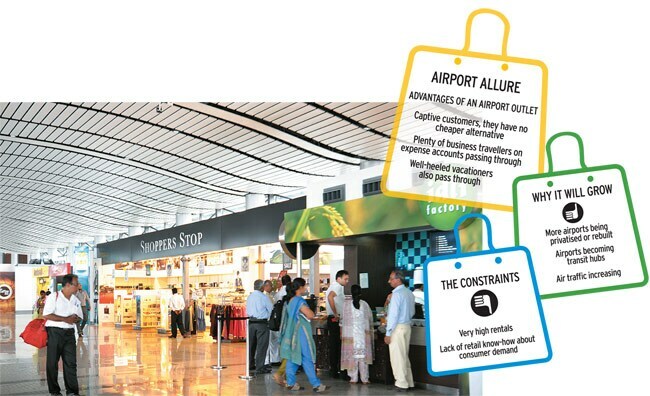 Not so long ago, in 2004, when GMR Infrastructure was given the task of developing the Delhi airport, it had to cajole and incentivise brands to open shop on the premises. "There were genuine concerns about whether customers would buy the products," says Romy Juneja, Vice President and Chief Commercial Officer, GMR Delhi International. But most retailers which chose to enter early are still there and thriving. These include the likes of Shoppers Stop, Croma Retail, Ethos Watch Boutiques and Hidesign. "The Hidesign brand is a perfect fit with airports, considering its customer is the corporate traveller," says Kapur of Hidesign, which has eight Hidesign and Holii stores at airports. Retailers, however, have to pay much higher rent per square foot for the space they occupy at airports compared with other locations in cities. "There is an assured customer base and you can directly target your core customers, that too seven days a week, so it makes sense for companies to be there, if they're ready to pay the higher rent," says Sushil Patra, Associate Vice President, Retail, Technopak, a consultancy firm. The returns per square foot are much higher at airports than at other stores. For Croma, the annualised realisation is close to Rs 1.2 lakh per sq ft at airports, while in the cities it is close to Rs 30,000 to 40,000 per sq ft. It is more profitable than the regular stores, says Joshi. "Our stores are as profitable as those at malls or high streets," says Govind Shrikhande, Managing Director, Shoppers Stop. It operates six stores at airports across the country. "Retailers would not stick around at airports if things were not working out for them," says Dutta of Third-Eye. 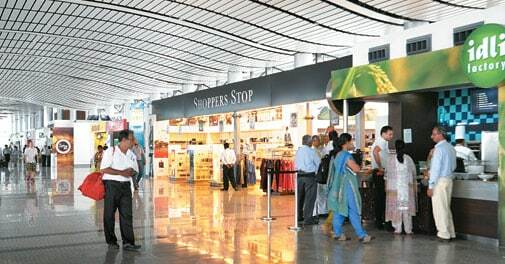 Airport retailing then appears poised to take root in India.